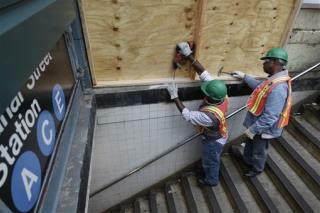 (Newser) – New York City will indeed shut its bus, subway, and commuter rail services in advance of Hurricane Sandy, Gov. Andrew Cuomo said today. Subways and trains will be suspended starting at 7pm today, with the last buses running at 9pm. He said the decision to shut down the area's bridges and tunnels would be made on a case-by-case basis. Some things I have learned over the years everyone should have long before this storm hits. 1. A generator gassed up and tested to run. You can't run it in the storm but once it clears you will be glad you have it. The cool thing about CFL's is that you can run a ton of them with very little load. Generators are cheap in the great scheme of things. Using it one time easily pays for itself. 1a You should have your furnace reconnected to the wall with an outlet instead of hardwired through. That way you can disconnect the furnace and run it off your generator. A 100K BTU 80% efficiency furnace takes about 400 watts. You cannot run your central air without some special knowledge but you can run a window unit easily. Alternately, you can have a transfer switch installed. It's really nice to have but does cost a few bucks but high amp extension cords are not cheap either. If the cord is hot, you are overloading it. 2. Extra gasoline and a full tank in the car. 3. A plan how to treat injuries and get to help. DON"T even expect help to come to you for days. 4. Water of course and maybe some ice. Ice is good for injuries. 5. A plan to keep the kids and pets occupied during the storm. Games and such. KIds and pets will feel what you feel. If it's no big deal to you, it won't be to them Fake it if you have to. 6. You really should have a gun for personal protection. Looters will ignore the strong. Guns are cheap in the great scheme of things. The more prepared you are, the less anxiety you will feel. Remember, you need to last at least 3 days without help. Probably more. Streets will be impassable and the world does not revolve around you. Responders have families too. But be ready to help others that may need you. nothing "sells" in the post 911 world like fear....fear is a main motivator in the ultimate control of a population,and if you notice, we are supposed to fear everything from our neighbors to nature.